The Thornbury Indoor Bowling Club, currently based in the Thornbury Leisure Centre, was founded in 1980 when the then new indoor bowling facilities were built there. The initiative was largely due to the enthusiasm for the game by Frank Maude, who was then Chief Executive of the Northavon District Council. Interest in the game in Thornbury spread fast and a shop selling bowls equipment opened for a short time in premises on the corner of St Mary Street and The Plain. Regular competitions and championships were organised at the Leisure Centre and some of these were even televised to a national audience! 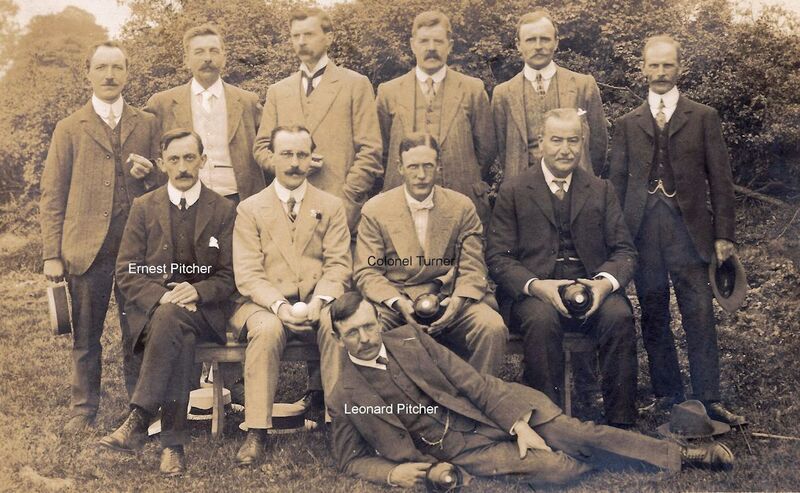 Our first references to bowls being played in Thornbury were in 1913. A plot of ground, part of Lower Marlwood Farm, was leased from the Harwood family. The green was officially opened on 29th May 1913 by Colonel C.E. Turner Esq. of Old Down House, Tockington. The photograph above was taken on the opening day, showing that the bowling green was located at the bottom of what is now the Mundy Playing Fields. The houses on the High Street can be seen in the distance and the adjoining tennis court can also be seen behind the bowling green. The bowling green and tennis court are marked on the 1923 ordnance survey map for Thornbury. 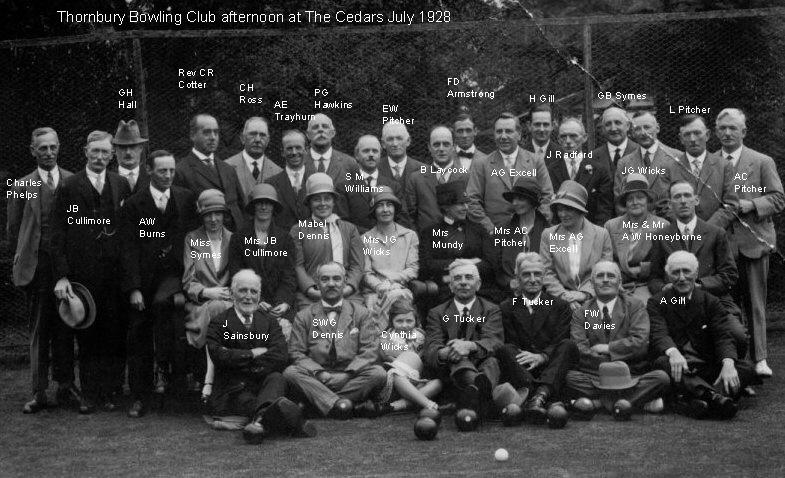 We have one other photograph above showing a group of the Club members which is thought to be taken at the time of the opening. We would be interested to hear from anyone who can identify any other member. The 1916 Prewetts Directory shows that the club was then known as the Thornbury Bowling Club and the officers were: President Col. C. E. Turner, Chairman J. G. Weeks, Secretary and Treasurer J. G. Allen. One of the key figures in the Club in the early days was Samuel Dennis, the headmaster of the National School (now known as St Marys School). He was Hon. Secretary in 1922 and we note a Gazette article dated 1923 in which his wife was appealing for other ladies to join her in forming a ladies team for friendly matches. In that period Major Basil Mundy was the President, Vice Presidents were Colonel Turner, Colonel Matcham, Major Algar Howard, Captain R. A. Bennett, Captain W. R. Jenkins, Dr E. M. Grace, Mr Armstrong, Mr A. Masters, Mr. F. Turner and John Hodges Williams. 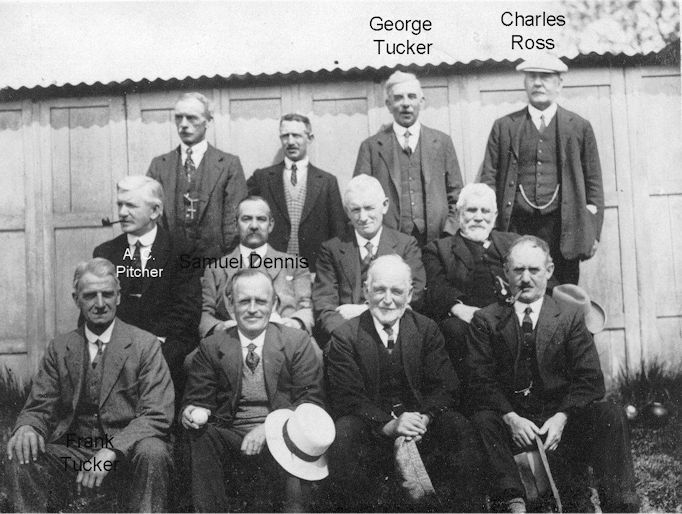 The Chairman was J. G. Wicks and the vice-captains were George Tucker and A. C. Huins. We have a photo of the Bowls Club taken around this time and we have been able to identify Samuel Dennis and several other members. Again we would be interested to hear from anyone who can identify anyone else. We know from match reports in the Western Daily Press dated July 1923 that the club was represented by A. Gill, A. Huins, J. Redford, L. Pitcher, H. Talbot, A. Thompson, B. Laycock, J. Dennis, S. Phillip, A. Exell, G. Hall, G. Tucker, A. Trayhurn, F. Tucker, T. Hall and A. C Pitcher. In September 1929 the Thornbury team in one match consisted of F. Tucker, C. Phillips, B. Laycock, A. C. Pitcher, C. H. Ross, A. Burns, S. Hall, L. Pitcher, E. Pitcher, W. Honeybourne, G. B. Symes and F. W. Davies. 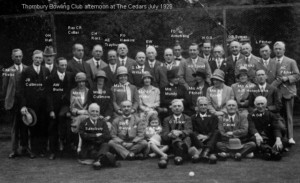 We have two more images, one, a group photo of the bowling club including the ladies taken in the late 1920s or very early 1930s, and another a list of club members dated 1937. Based on the names of the people involved in the playing of the game it was popular amongst the shopkeepers, trades people and teachers. Samuel Dennis was Secretary of the Thornbury Bowling Club from 1921 to 1954. He was the headmaster of the National School and ran the bowling club from his house at Selwood, now numbered 22 Gloucester Road. The letterhead of the Club shown on the above members list dated 1937 shows that it was given the very memorable telephone number ‘Thornbury 1’. Samuel’s wife, Mabel, was also a prominent member of the ladies bowling club. The bowling club continued paying the rent to the Harwood family until 1947 when Dr Basil Harwood conveyed the site occupied by the tennis and bowling clubs to Thornbury Parish Council, as a memorial to his father, Edward Harwood. He had been a well known banker in the Town. The deed of gift stipulated that the bowling green was to be named ‘Edward Harwood Bowling Green’ but we can find no later reference using that name. We understand that the green fell into disrepair and in 1958 the members of Thornbury Bowling Club moved to join the Olveston Bowling Club. The bowling green site was used to expand the number of tennis courts and there was no more bowling in Thornbury until the indoor greens were open in 1980.